KINSHASHA – Europe and Africa heaped pressure on DR Congo on Friday, urging it to respect voters’ wishes in key presidential elections as a deadline for unveiling the outcome loomed, French 24 reports. 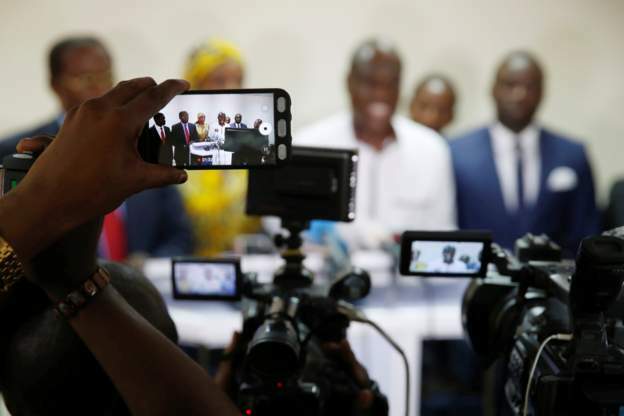 Expectations are mounting that, electoral overseers will delay publication of provisional results due by Sunday — a move likely to add to tensions in the notoriously unstable country. “The Democratic Republic of Congo is at a historic moment toward a democratic transition,” the European Union said in a statement. The EU called on the authorities in DRC “to ensure the upcoming results conform with the Congolese people’s vote”. A similar appeal was made by the African Union after it was briefed by the head of an 80-member AU election monitoring team. “Respect of the election results is crucial,” AU Commission chief Faki Mahamat tweeted. On Thursday, the United States called on the DRC to release “accurate” results and warned of sanctions against election violators. “Those who undermine the democratic process threaten the peace, security or stability of the DRC, or benefit from corruption may find themselves not welcome in the United States and cut off from the US financial system,” the State Department said. The UN Security Council met behind closed doors to discuss the election, but after two hours of the meeting had failed to agree on a press statement. Several countries including African nations said such a move was premature, diplomats said. French Ambassador Francois Delattre, whose country had requested the meeting, said: “the consolidation of the results must continue with transparency”. The elections last Sunday, which had been delayed three times, were called to choose a successor to President Joseph Kabila, at the helm of sub-Saharan Africa’s biggest country for nearly 18 years. Polling day went ahead relatively peacefully by the DRC’s turbulent standards. But in a country that has not had a peaceful transition of power since independence from Belgium in 1960, memories of electoral fraud and bogus claims of victory run deep. Opposition campaigners fear the result may be rigged to favour Kabila’s preferred successor, hardline former interior minister Emmanuel Ramazani Shadary. In the run-up to the election, Western powers repeatedly urged the count to be conducted accurately, transparently and expediently. But on Thursday, the Independent National Electoral Commission (CENI) said it had collected only about a fifth of the results. CENI blamed massive logistical problems in a country the size of continental Western Europe but with poor infrastructure. It indicated that it may have to postpone publication of provisional results — due to be published by Sunday, followed by the definitive results on January 15 and the presidential inauguration three days later. Within hours the DRC’s powerful Roman Catholic Church, which had deployed thousands of election observers, declared that it knew who had won from its own monitoring of the tally. It called on the election panel “to publish the election results in keeping with truth and justice”. A coalition of pro-Kabila parties on Friday angrily rebuffed the comments, which were made by the National Episcopal Conference of Congo (CENCO). CENCO had an “anarchic, irresponsible and biased attitude,” the Joint Front for Congo (FCC) said. It accused CENCO’s spokesman, Father Donatien Nshole, of “seriously breaching” the constitution and electoral law by “illegally declaring voting trends” in favour of a given candidate.